When he learns that the nightingale's song is one of the most beautiful sounds in the world, the Emperor of China sends his courtiers to find the bird and present it as a guest at court. 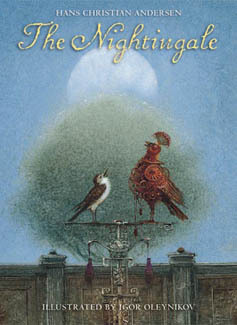 The nightingale can speak to humans and agrees to come, but when the Emperor receives a mechanical nightingale covered in jewels, he discards the real bird, which flies back to its home. Hans Christian Andersen’s beloved story in which a king learns humility from a bird was written in 1843 to honor Jenny Lind, the famous opera singer dubbed the Swedish Nightingale. This new edition of the childhood favorite features shimmering color illustrations by Russian artist Igor Oleynikov. In China, you know, the emperor is Chinese, and all his people are Chinese, too. This story happened a great many years ago, so it is well to hear it now before it is forgotten. Ben Bear is excited to get a new puppy. He names him Luke and asks his friend Chris Croc to help him build a dog house. Working together, the two saw, hammer, paint, and decorate, and in no time the dog house is built. But that night, after his friend goes home, Ben Bear can't sleep. He tosses and turns, tries counting sheep, and listens to the tick-tock of the clock. As Ben thinks back over the events of the day he suddenly remembers the very important thing he forgot to do! Ben Bear got a new puppy. He named him Luke. "I'm going to build you a dog house," said Ben Bear. "I'll ask my best friend Chris Croc to give me a hand." Chris Croc was glad to help. They sawed and hammered, they painted and decorated. Working together, they built Luke's dog house in no time at all. They finished just in time for supper and happily shared a pizza. Then Chris Croc said goodbye and headed home. That night Ben Bear could not fall asleep. He tossed and turned, and tossed some more. He tried counting sheep but that didn't help. He lay there, wide awake, listening to the ticking of the clock. Something kept nagging at him, something he forgot to do. Polly drifts off to sleep and is awakened by a strange noise. Beside her bed stands an adorable — but lost — little lamb. The lamb asks Polly to help it find its mother, and Polly kindly agrees. Their moonlit quest takes them uphill and down, across meadows and fields. Along the way, they meet many animals who have some, but not all, of the attributes of the little lamb's mother. 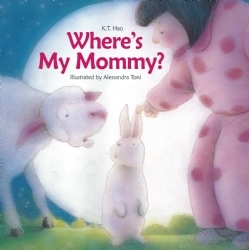 Will Polly succeed in helping the little lamb find its mother? 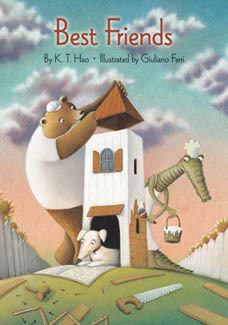 Alessandra Toni’s enchanting illustrations help make this gentle bedtime story as warm and loving as a kiss goodnight. One cool summer night, Polly snuggled in bed, waiting for her mommy to give her a good night kiss. All the doors and windows were open and Polly could hear crickets chirping away outside. She had just drifted off to sleep, when suddenly she was awakened by a strange noise. She opened her eyes wide. Standing right in front of her was a fluffy little lamb. Ben’s mother is painting the living room with nice, smooth, even strokes. Painting’s hard work, so she settles down for a short nap. While she sleeps, Ben decides to finish the job. Nice, smooth, even strokes are boring, though, and Ben has a bright idea for livening up the job — and the walls! 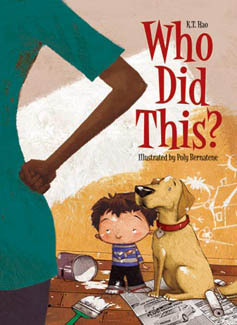 But when the ladder somehow tips over, and the good china somehow gets broken, all Ben can do when his mom demands, “Who did this?” is point to his dog, Booboo — a fib that has unexpected repercussions. Whimsical, color-drenched illustrations complement this fast-paced, funny story. One day Ben’s mom decided to paint the living room. She got up early and started right in. Her paintbrush went up and down, up and down in nice smooth strokes. While she worked, Ben played happily with his dog, Booboo. Painting was hard work. After a while mom needed to take a rest, so she curled up on the sofa and went to sleep. At first, Ben painted just like his mom, up and down, up and down in nice smooth strokes. “This is boring,” said Ben, so he started to paint a picture on the wall. He painted a house with a big sun shining down, then he added some grass and a boy standing in the yard. As Ben stepped back to admire his picture he bumped into the ladder. The ladder started to tip over and knocked down all of his mom’s pretty china!